The Port of Hollyhead is located at the far west of the Isle of Anglesey in North Wales. 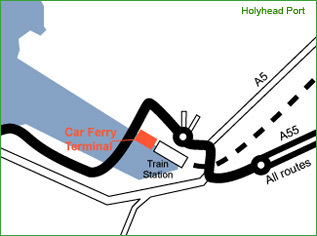 The Ferry Terminals, one for passengers & one for vehicles, are operated by Stena Line & Irish Ferries, operating services to Ireland. There are frequent buses and coaches to Anglesey and Holyhead from England and Wales. On Anglesey there is a local network of buses which service all parts of the island. Holyhead is on a main rail line with connections and services from most parts of the UK (4 hours from London; 2 1/2 hours from Manchester). The Port is situated near to Holyhead Town Centre, and is reached by following the A5 from the Midlands, or by the A55 from Chester. Once you reach the Town Centre, follow the signs to the Ferries. 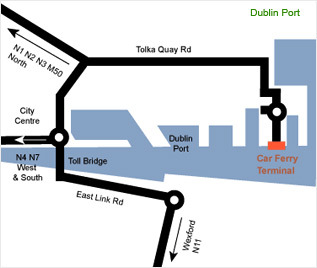 Directions to Dublin port by car. There are two ferry terminals in Dublin. The first at Dun Laoghaire is six miles south of the city centre (30 mins by DART train to the centre). Dublin Port is close to the city centre and is well signposted. From the city centre, follow the Quays from OConnell Bridge down to the Point Depot music venue, then turn left and follow the road all the way to the port. Take a Ferry to Ireland with Which Ferry to see this famous green country. But there are more colours than green in Ireland. Ireland is criss-crossed with silver streams, lazy rivers, hidden lakes and still canals. Throughout the country, there'`s trout and salmon fishing for anglers. Canals, rivers and larger lakes can be explored from the banks or from hired boats. With a Ferry to Ireland you will also find the blue of the sea. You are never more than 80 miles from the sea and a coastline offering golden, sandy beaches, dramatic cliffs, hidden harbours and bays. The central plain of Ireland is surrounded by a ring of hills and mountains. Hues vary from the deep purple of heather to the black of turf bogs and vistas range from the gentle slopes of the Slieve Bloom mountains to the steep, wooded valleys of Wicklow and the awe inspiring Cliffs of Moher. Apart from the scenery and nature Ireland also offers plenty of activities for all tastes. Whether you like deep sea fishing or fly fishing, pony treks or horse racing, a taste of golf or experienced golfer, guided walks or the freedom of walking independently Ireland has plenty of offers for you. If you prefer the city experience than take a Ferry to Ireland and sail directly to the historic cosmopolitan capital Dublin with its lively nightlife and plenty of Irish Pubs and international Cafes. The aroma of freshly brewed coffee mingling with the distinct smell of hops from the Guinness brewery. If you're looking for a lively city, a glimpse of an ancient civilisation, a cultural feast, a musical odyssey, stunning scenery, and a spectacular coastline - you'`ve come to the right place! A Ferry to Ireland will take you there to explore all of the above. Explore Ireland by car, on foot, by bicycle or on horseback. Explore Ireland with whichferry.co.uk. Our ferry routes include; Liverpool to Dublin, Cairnryan to Larne and Troon to Larne with P&O Irish Ferries. You can also use the ferry services of Irish Ferries to and from the ferry ports of; Hollyhead to Dublin, Pembroke to Rosslare, or if sailing between Ireland and France: Rosslare to Cherbourg and Rosslare to Roscoff.